Your marketing message goes to our entire data base, fans and industry professionals alike. and the responses go to you. Take advantage of our awesome database. Get your FREE year-round e-newsletter! The Blues Festival e-Guide is jam-packed with latest blues CD releases, industry news, contests, House of Blues Radio Hour, Roots Blues Airplay Charts and upcoming Blues festivals. 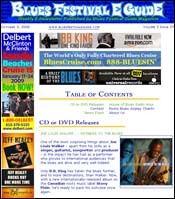 The Blues Festival e-Guide is a weekly, electronic newsletter about everything Blues including links to latest releases, industry scuttlebutt, roots music charts, Elwoods BluesMobile radio programming, musician's tour dates, new Blues services and products, and of course festivals. The e-Guide is a wonderful resource for everyone interested in Blues! You can expect to see the e-Guide in your inbox each Thursday.